4 What is The Alarming Truth? Blessings for this New Year and a wish to you all for a safe, happy and successful 2015. As we are close to Valentine’s Day, our hearts are filled with much appreciation for our many friends. We have had a very busy and fruitful 2014. Our travels and work has introduced us to amazing students, school officials, fire and safety personnel and others who are really interested in making a change and raising their standards of Campus fire and life safety. We are excited about the coming year. Just this past week, I was reminded what a small world we live in and overcome by the coincidence of people we may meet along the way. 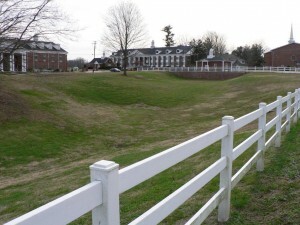 I visited a campus, Young Harris College in Young Harris, Georgia and was speaking with one of the administrators about doing a community service project at this school in the mountains of North Georgia. While in the meeting, a young man knocked on the door and asked to come in. This young man introduced himself and said he had attended Murray State University with my son, Michael. He knew all about the arson fire and the circumstances that lead to Michael’s tragic death. He is on staff at Young Harris College and will be working with the Minger Foundation on our community service and outreach project with the students and safety professionals in this North Georgia mountain community. A young man from Kentucky, meeting with a mother from Florida to work on a fire safety community service project in Georgia. Bringing so many together to raise awareness and improve safety for generations to come. 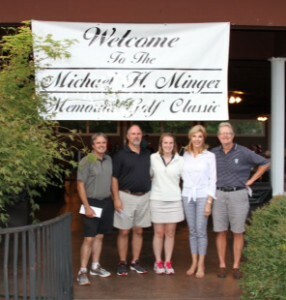 Over 100 people joined us for the eighth annual Michael H. Minger Memorial Golf Tournament in September at the Hermitage Golf Course in the Nashville area last September. This annual event is the major fundraiser for the Foundation.This money helps to underwrite scholarships that the Foundation gives to students, such as those who have been through the horrors of a fire, and education and outreach efforts that the Foundation does throughout the year. I appreciate the incredible support that we have received from our friends in the fire safety industry who give so generously. I am looking forward to another outing in September in Nashville, and I am also looking at the possibility of a second tournament, possibly in Florida as well! One of the challenges of communicating fire safety to students is doing it in a way that is both engaging and informative. Video is what this generation is using, and a challenge was put forward to the students at the University of the Cumberlands in Kentucky to come up with some ideas-and they rose to the challenge. Each dormitory started brainstorming ideas on how a video could convey the ideas of cooking safety, smoking or exits to students. A number of other videos have been made over the years, but so many of them are too long or are the “talking head” type of production. In today’s YouTube era, videos have to be short, short, short-often, no more than 90 seconds, in order to get some viewing time. A panel of resident assistants and resident directors looked over the many suggestions and ideas that were put forward and narrowed them down to about half-a-dozen, which were then presented to the Minger Foundation. They certainly were different, some edgy, but if they would work, that is what we were looking for, and we wound up picking three finalists. 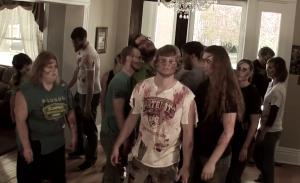 One built on the wildly popular series “The Walking Dead” with a zombie theme, “which, initially, I didn’t think that much of,” said Gail Minger. However, the students explained to her how zombies were “the thing” with students, she realized that this could very well be the exact type of messaging that was needed, and this was green lighted. Another idea was a student being chronically unsafe, such as leaving candles unattended, overloading outlets, and falling asleep while smoking. Each time, he is tackled by a football player for “being a moron,” and by the end of the video, after a series of building injuries, he was learning his lesson. Both of these videos were shot at the University by students from the school’s film program using other students as actors. When the call was put out for students to be zombies, there was no shortage of actors, who were all made up by students from the school’s theater department. For the “moron” video, a member of the school’s football team played the very realistic role of the football player doing the tackling, probably much to the chagrin of the student actor! The last video was one about cooking fire safety that was a play on the popular Beyoncé song “Put a ring on it” with the words “Put a lid on it.” Because of possible copyright issues, this one has not been filmed yet and the students are trying to get permission to use the song, so hopefully sometime this spring we’ll be able to get to work on it. The ideas, and enthusiasm, that the students put into these three videos was so refreshing and helped us break out of our “same-old, same-old” ideas when it comes to trying to communicate fire safety messages. When they are done, all of the videos will be posted at the Minger Foundation web site and will be available for anyone to use on their campuses or in their communities. What is The Alarming Truth? 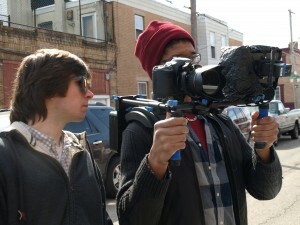 In 2013, the Clery Center launched an ambitious project to produce a short film about the dangers of off-campus fires. This is where four-out-of-five people are killed in fires, so it is clearly the most dangerous place for students to be living, and it is also where most of the students across the nation live. This project, funded through a FEMA Fire Prevention and Safety Grant to the Clery Center, was a collaboration between a number of organizations focused on campus fire safety, including the Minger Foundation, Campus Firewatch, the University of Pennsylvania, the Philadelphia Fire Department and Rowan University. It was an update to the 2001 film produced by Ed Comeau from Campus Firewatch called “Graduation: Fatally Denied” that told the story of a fatal off-campus fire through the eyes of a fictional student, and while it was a “reboot” of this film, much was changed because of the key involvement of students from Rowan University’s Film and Television Department. These students were vital in providing a real-world perspective on what would appeal to their peers. In today’s YouTube world, it is so important to keep it short, to the point, yet entertaining enough. To help accomplish this, the film focuses on just three important topics-smoke alarms, smoking (the leading cause of fatal fires), and exits. The initial concept had been to shoot the entire project through the eyes of a student, just as the original film had been done. However, the students felt that this would not be a good direction to go, that it may not have the appeal to students that we were looking for, so we started brainstorming different ideas on how to create an engaging story. 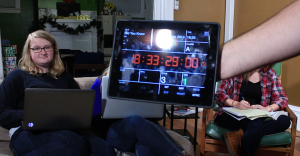 The logistics with putting together a short production can be just as involved as a larger one, we quickly learned. You still need a crew, a cast, camera equipment, lighting and sound, all of which were coming out of Rowan. But one of the more challenging hurdles to overcome was finding a location where we could shoot over several days. We were incredibly fortunate that one of our key partners on this project was Gene Janda, the University of Pennsylvania’s chief of fire and emergency services. Gene arranged for us to look at a number of properties that the University owned, and while some of them might have worked, none of them were exactly what we were looking for. There was one more place to look at, however-Gene’s family house, where he grew up. It was undergoing renovation so it was empty and available for us to use, which was incredibly fortunate and was just perfect for what we needed. The Philadelphia Fire Department was another key partner in this project and provided a tremendous amount of support throughout. Firefighters, ambulances, engines, ladder trucks-pretty much whatever we needed, they made available. Since this was a film about fire safety, we obviously needed to have some live fire in it. Gene was understandably reluctant to have us start any fires in his house, so we rebuilt a portion of his living room down at the fire department’s Training Academy and set the couch on fire, filming it all. The story of this fire includes having the student seriously injured and being treated in an emergency department, so we had to come up with a hospital setting. Again, the University of Pennsylvania came through and gave us access to their medical training simulator facility where they set up a room and provided us with all of the staff that we needed. No film project goes as planned, there is always some unanticipated event that happens, and for this one it was a major snowstorm that shut down the city for a day-although, filming in Philadelphia at the end of February, we can’t really say that this was “unanticipated!” We were able to regroup, shift the schedule, and keep on going, fortunately. After a number of editing sessions, a rough cut of the film was shown to student focus groups in Massachusetts, Philadelphia and Florida. This feedback was incredibly important to us in crafting the final product. To help promote it, we did a series of presentations in six of the 10 FEMA regions, which were all well attended by both community and campus fire officials. This was a fantastic partnership between a number of great organizations, and the end result is a powerful video that you can use in teaching students about the dangers of off-campus fires. 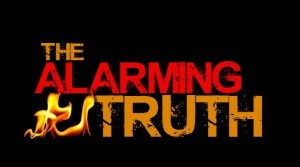 The Alarming Truth is available for free download at www.alarmingtruth.org and you can also follow it on Twitter @alarmingtruth. Teaching students about fire safety is a challenge, so it is important to come up with creative and different ways to get the messages across. One way, that the Minger Foundation has been working on for several years, is the concept of Campus Fire Safety Community Service Projects. 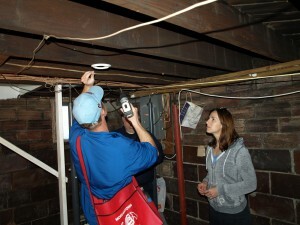 Basically, it is joining students with fire departments to go out into the community and do smoke alarm installations. These are programs that many fire departments have been doing for years, but by including students in them, the students learn about fire safety first-hand by doing fire safety. At the same time, they are doing community service work, which many schools are strongly encouraging and, in some cases, even making it a requirement for the students. Each of these schools and communities were different in terms of their makeup, needs, structure of the fire department and the community demographic. In Morgantown, it is a large state school, a full-time fire department and a county with high poverty. 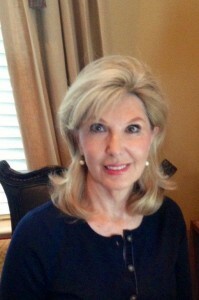 In Mississippi, it is also a large state school, but with a volunteer department. 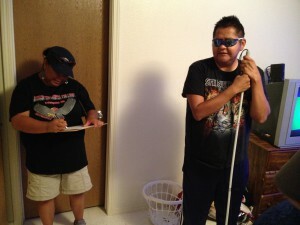 One of the students from the Navajo Technical University documenting the visit in one of the homes. Two interesting places where we did the project were the Navajo and Tohono O’odham Indian reservations. We worked with students from the schools, and the Crownpoint Fire Department is a volunteer department covering just Crownpoint, while the Tohono O’odham Fire Department is full time, but covers the entire nation out of two fire stations. In Philadelphia, we worked closely with the Philadelphia Fire Department and the University of Pennsylvania on a project that had a different twist to it. 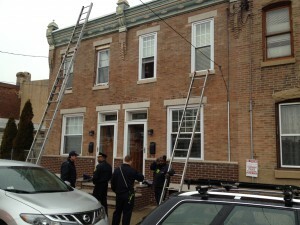 Instead of college-age students, the fire department’s Cadet and Explorers took part. These are high-school-aged students that are learning about fire fighting, with the hopes of possibly getting into the fire service someday. They are all becoming emergency medical technicians and learning how to do fire suppression, but this was a great opportunity to teach them the importance of fire prevention and safety. Along with these on-site programs, we did a train-the-trainer session in Mississippi that the State Fire Marshal’s office arranged to have broadcast statewide. The goal of the project was to develop a system that schools and communities could use if they wanted to do a community service project. From previous efforts by the Minger Foundation and others, we came to realize that the biggest drawback to these programs was that they were trying to communicate too much information, both to the students and to the people in the community. There is so much we want people to know about being fire safety that we are often guilty of trying to tell them about smoke alarms, smoking, cooking, heating, electrical safety-the list goes on. Instead, we focused on three very important topics for this program that included smoking, cooking and exits. We chose these because smoking is the leading cause of fatal fires, cooking is the leading cause of all fires, and knowing two ways out can make all of the difference, no matter where you are. Not only are these potentially life-saving skills, but each of them are within the student’s ability to control. They can install their own smoke alarms, they can learn how to cook safely, and they can develop the habit of taking a few seconds and looking around for the second way out. A project team was put together made up of Gail Minger; Corey Lewis, a fire fighter and fire prevention officer for the Richmond, Kentucky, Fire Department; and Ed Comeau, publisher of Campus Firewatch. We put a lot of work into developing the training materials and handouts, and helping us along the way was a group of students and subject matter experts who reviewed them, providing us with great feedback. Two interesting things emerged out of this review meeting…the first is that we were always using the word “egress,” and the students didn’t know what it meant (they had to Google it), so we made sure to change it to the more common word “exits.” The other was about smoking, which also came up in The Alarming Truth project. At first, the students thought we were coming down hard on smokers, “another anti-smoking message,” and they looked at it as another authority-figure kind of rant. When we explained to them that smoking is the leading cause of fire deaths and that is why we were giving it so much emphasis, they then understood where we were coming from. Throughout the training we have done over the years, we really try to give them the “reasons behind the rules” so they understand the rationale. People are far more accepting of a “rule” when they know the reason behind it. We are in the process of putting together the materials from this project and will be posting them on our web site for anyone to use in their own communities. Throughout all of the programs and training the Minger Foundation has done over the years, we have really tried to learn how to communicate with students more effectively and what works best. Without a doubt, video has become the “go to” method of communication with this demographic with the huge growth of YouTube and the ability to easily shoot videos on smartphones. Building on this, we are working on putting together a series of videos with the theme of “Did You Know.” Each video, and they will be short, will have students talking about a series of fire facts that the average person may not be aware of, such as “Did you know that smoking is the leading cause of fatal fires?” We have filmed these at the University of the Cumberlands over the course of a couple of days, and we are now deep into the editing process. We’re going to make these available on YouTube for schools and communities to use in their education efforts. Finally, this year we are working on a focused effort to get the building of Amadeus House under way. The Foundation will be sending out information, along with a short video about this project to our many friends in the next few weeks. It has been a dream of mine for many years and we are working hard to make it a reality. It will be a state of the art facility and hopefully a model for many universities to consider for their campus.